As I promised yesterday, here’s the outfit I wore on new years eve. I celebrated NYE at one of my uncle’s home with family and my boyfriend. My uncle’s birthday is the first of january, so he always celebrates his birthday on new years eve. The last few years I didn’t go to his house at new years eve and since he and his wife had bought a new house recently, me and the boyfriend decided to crash his new years eve birthday party this year! This is what I was wearing! Cheers on the new year! Die peplum top en rok staan je leuk! Je ziet er heel leuk uit, vooral het kraagje en die rok zijn schitterend! Prachtige outfit, die top en het kraagje zijn zo mooi! Wat leuk! Je maakt van een zwart-wit outfit altijd wat leuks zeg! Hele leuke outfit ,vooral je rokje is leuk! LOV EIT!! !THE SHOES AND THE SKIRT ARE GORGEOUS!!!! Staat je goed. Love, Marloes. wauw, rokje staat je prachtig! 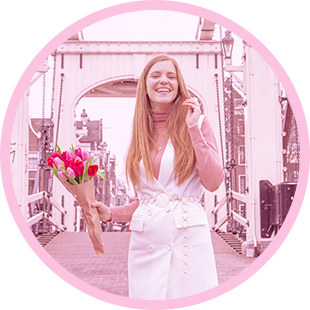 I'm Sonja, a fashion loving Dutchie living in Amsterdam. I'm a huge fashion lover, and I'm also a vegetarian, a crazy cat lady, an interior and pancake junkie, and I'm all about living a green and cruelty-free lifestyle! me before using it. Thank you for your understanding.